The Patriots will place Hill (knee) on IR, Mike Reiss of ESPN.com reports. Analysis: Hill lands on IR after tearing his right ACL in Sunday's season-opener. Now that he's out of the mix, the Patriots' backfield is currently whittled down to the trio of Rex Burkhead, James White and Sony Michel (knee). Analysis: Hill suffered the injury shortly after halftime in Sunday's 27-20 win over Houston, finishing with four carries for 25 yards and one catch for six yards. His absence for the remainder of the season should free up a few more carries for Rex Burkhead and Sony Michel (knee). 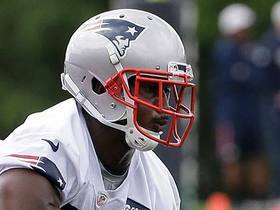 The Patriots will place Hill on injured reserve, Jim McBride of The Boston Globe reports. Hill's knee injury may be serious, WEEI.com's Ryan Hannable reports. Analysis: Per Mike Reiss of ESPN.com, Hill did not seem to be putting much pressure on his leg as he walked to the medical tent. Prior to his exit from Sunday's game, Hill had carried four times for 25 yards and caught one pass for six yards. Rex Burkhead and James White remain on hand in the Patriots' backfield Sunday, with Sony Michel (knee) inactive for Week 1. Analysis: Hill missed little time before being re-inserted on special teams. He relayed after the game that he was fine and didn't show signs of limping. That's great news for the Patriots, as the 25-year-old has had a solid preseason, accruing 121 yards from scrimmage and one touchdown. Hill limped off the field during Friday's preseason game at Carolina, Ben Volin of The Boston Globe reports. Analysis: Hill was taken down via a horse collar tackle prior to leaving the contest. The nature and severity of the injury is unknown, but he was having an impressive preseason, racking up 26 carries for 107 yards and one touchdown to go with two catches for 14 yards. Hill rushed for 31 yards on six carries during Thursday's 37-20 win over Philadelphia. Analysis: Hill dealt with a leg injury this week, but rebounded to average five yards per touch for the second consecutive week. New England is loaded at running back and Hill hasn't averaged four yards per carry during a full season since his rookie campaign in 2014. If he's able to keep this pace up, however, he could be a valuable power back to complement the Patriots' collection of shiftier ball carriers. Hill (leg) was not mentioned as one of the Patriots' players missing from warmups prior to Thursday's preseason game against the Eagles, Doug Kyed of NESN.com reports. Analysis: Unlike the regular season, teams aren't required to submit official inactive lists for exhibition tilts. What is known is that Hill appeared to tweak his leg at practice Monday, so it's unclear what sort of workload awaits him Thursdays, if he is indeed deemed available by New England's coaching staff. Hill (leg) isn't practicing Tuesday, Kevin Duffy of MassLive.com reports. Analysis: Hill was clutching his right leg when he left the practice field Monday, foreshadowing Tuesday's absence. He built a nice lead on Mike Gillislee with 11 carries for 51 yards and a touchdown in the preseason opener, but things could tilt back in Gillislee's favor if Hill doesn't get back on the field soon. With Hill, Sony Michel (knee) and Rex Burkhead (undisclosed) all likely to miss Thursday's preseason game against Philadelphia, the Patriots figure to keep Gillislee and Ralph Webb busy. Hill walked off the practice field Monday holding on to the back of his right leg, Mark Daniels of the Providence Journal reports. Analysis: Though he didn't retreat to the locker room afterward, Hill didn't take any more handoffs through the rest of the session, making this a situation to monitor in the coming days. Hill, who logged 11 carries for 51 yards and a TD and caught two passes for 14 yards in Thursday's preseason game against Washington, is looking to secure a role in the Patriots' backfield behind roster locks Sony Michel (knee) and Rex Burkhead (undisclosed). His primary competition on that front is Mike Gillislee. Hill took 11 carries for 51 yards and a touchdown and caught two passes for 14 yards in Thursday's 26-17 preseason win over Washington. Though Hill is part of a crowded backfield in New England, he feels ready to compete now that he has addressed the ankle issue that slowed him prior to undergoing surgery last November, Mark Daniels of the Providence Journal reports. "I just wasn't myself," Hill said of his pre-procedure form. "I really didn't have the flexibility and the strength in [the ankle] that I needed to be the back that I wanted to be. I'm glad that I got it done and I can get it back to 100 percent and be the back I know I can be." Hill has made a good impression with his work during the Patriots' voluntary offseason program, ESPN's Mike Reiss reports. 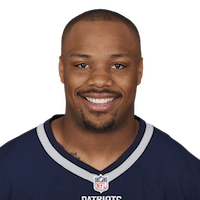 Hill likely will have to compete for a roster spot, as his one-year, $1.5 million contract with the Patriots only includes $150,000 guaranteed (in the form of a signing bonus), Ben Volin of The Boston Globe reports. The Patriots signed Hill (ankle) to a contract Friday, Field Yates of ESPN reports. Analysis: Hill surprised his previous employer, the Bengals, when he underwent season-ending ankle surgery in early November. The impetus was his upcoming status as a free agent, but upon landing in New England, he joins another backfield populated by Rex Burkhead, James White and Mike Gillislee. Hill is a fair bet to be involved on a weekly basis, but consistency may be difficult to attain due to the situation. Hill (ankle) is visiting the Patriots on Friday, Field Yates of ESPN reports. Hill (ankle) doesn't expect to be a Bengal for the 2018 season, Jim Owczarski of The Cincinnati Enquirer reports. "Been one hell of a ride Cincinnati on to the next chapter," Hill posted on his personal Twitter page. Jim Owczarski and Paul Dehner Jr. of the Cincinnati Enquirer relay that Hill (ankle) seems unlikely to return to the Bengals. Bengals coach Marvin Lewis said he was surprised when he learned that Hill was opting for season-ending surgery on his injured ankle, Paul Dehner Jr. of The Cincinnati Enquirerreports. The Bengals have placed Hill (ankle) on the Reserve/Injured list, Adam Schefter of ESPN reports. Analysis: Hill's addition to the Reserve/Injured list means rookie Joe Mixon will presumably handle the bulk of the work in the Bengals' backfield for the remainder of the season. Giovani Bernard also figures to play a change-of-pace role for the team. Hill's 2017 season will end with 116 yards accumulated on 37 carries, but he failed to reach the end zone for the first time in his four-year career. Hill (ankle) has been ruled out for Sunday's game against the Titans, Geoff Hobson of the Bengals' official site reports. 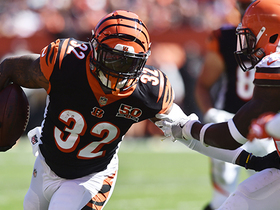 Analysis: Hill's second straight absence paves the way for Joe Mixon to continue to handle the bulk of the work in the Bengals backfield Sunday, with Giovani Bernard also on hand to work in a change-of-pace role Week 10. Hill (ankle) wasn't present for Thursday's practice, Jay Morrison of the Dayton Daily News reports. Analysis: Hill's ankle injury came out of nowhere to sideline him for the Week 9 loss to the Jaguars, but a Week 10 absence would be less surprising given that he has yet to see the field for either of the Bengals' first two practices. Look for the Bengals to issue formal word on Hill's status for Sunday's game against the Titans following their final practice of the week Friday. Regardless of Hill's health, rookie Joe Mixon looks poised to head the Bengals' backfield once again. Hill (ankle) isn't practicing Wednesday, Paul Dehner Jr. of The Cincinnati Enquirer reports. Analysis: Hill wasn't listed on last week's injury report, but ended up going down as a late scratch for Sunday's 23-7 loss to the Jaguars due to the ankle injury. His absence allowed Joe Mixon to start at running back and play a season-high 72 percent of the Bengals' offensive snaps, though it equated to only 28 total snaps due to Jacksonville's dominance of possession. Another absence from Hill would slightly improve Mixon's outlook for Sunday's game in Tennessee. Hill is inactive for Sunday's game against the Jaguars due to an ankle injury, Ian Rapoport of NFL Network reports. 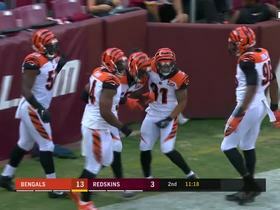 Running back Jeremy Hill accomplishes a first down for the Cincinnati Bengals after shaking off Cleveland Browns' defense. 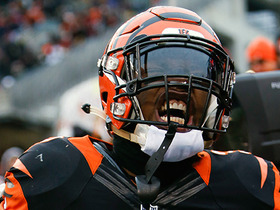 Watch Cincinnati Bengals running back Jeremy Hill nearly front-flip to get a first down. Watch highlights of the Cincinnati Bengals from the 2017 preseason. 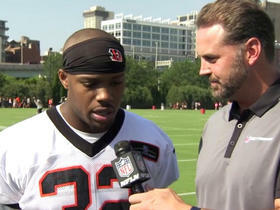 Cincinnati Bengals running back Jeremy Hill talks with NFL Network's Shaun O'Hara about bouncing back after a down season, working/competing with rookie Joe Mixon and his thoughts on Odell Beckham. 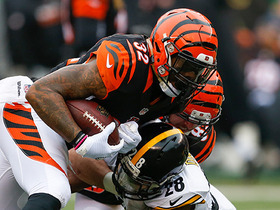 Cincinnati Bengals running back Jeremy Hill powers ahead for a 4-yard touchdown. 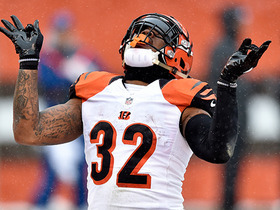 Cincinnati Bengals running back Jeremy Hill picks up 12 yards on run. Cincinnati Bengals running back Jeremy Hill runs in a 1-yard touchdown. 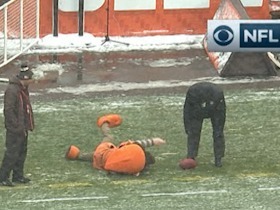 Even the Cleveland Browns mascot had a bit of a rough day, slipping while trying to get the ball. Cincinnati Bengals running back Jeremy Hill leaps over a defender for 8-yard gain.